The daughter of Kathy Glick and Kirk Kane, Andrea resides in Mt.Pleasant Iowa and attends Mt. Pleasant Community High School as a senior. Andrea is very excited to be sharing her love for the sport of rodeo with rodeo fans through out the state of Iowa as she travels promoting the PRCA rodeo circuit. Andrea works at a local business in Mt. Pleasant and is involved in her country 4-H club, saddle clubs, and competition and sideline cheerleading. She enjoys showing her horse in speed events at local rodeos and horse shows. Andrea plans to attend Kirkwood Community College to major in Agriculture Business. 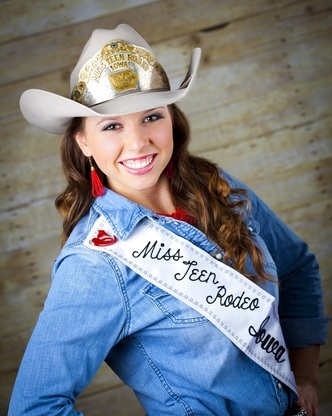 Andrea loves the western way of life and the rodeo atmosphere, she is looking forward to traveling throughout Iowa with her horse attending rodeos and living her dream as Miss Teen Rodeo Iowa. In addition to earning the title of Miss Teen Rodeo Iowa, Andrea also captured the Horsemanship Award, the Bob Britton Speech Award, and Photogenics awards as well as being recognized for here sales achievement by selling the most raffle tickets and raising the most money during the rodeo People's Choice campaign.